The music of National Medal of Arts recipient Morten Johannes Lauridsen, Composer-in-Residence of the Los Angeles Master Chorale from 1995–2001 and Distinguished Professor of Composition at the USC Thornton School of Music for fifty years, occupies a permanent place in the standard vocal repertoire of the 21st century. His eight vocal cycles—Les Chansons des Roses (Rilke), Mid-Winter Songs (Graves), A Winter Come (Moss), Madrigali: Six "FireSongs" on Italian Renaissance Poems, Nocturnes (Rilke, Neruda and Agee), A Backyard Universe (Witt), Cuatro Canciones (Lorca), and Lux Aeterna—his series of sacred a cappella motets (O Magnum Mysterium, Ave Maria, O Nata Lux, Ubi Caritas et Amor and Ave Dulcissima Maria), numerous instrumental works and art songs are featured regularly in concert by distinguished artists and ensembles throughout the world. O Magnum Mysterium, Diraiton (from Les Chansons des Roses), O Nata Lux (from Lux Aeterna) and Sure On This Shining Night (from Nocturnes) have become the all-time best-selling choral octavos distributed by Theodore Presser, in business since 1783. Nearly two million copies of his musical scores have been sold. His principal publishers are Peermusic (New York/Hamburg) and Faber Music (London). most frequently performed American choral composer." His life as a composer has been documented in Michael Stillwater’s awardwinning film (including being the Audience Choice at the first Friday Harbor Film Festival in 2013) Shining Night: A Portrait of Composer Morten Lauridsen. Lauridsen now divides his time between Los Angeles, his home on San Juan Island and his summer cabins on a remote island off the northern coast of Washington State. artists and arts patrons by the United States government. 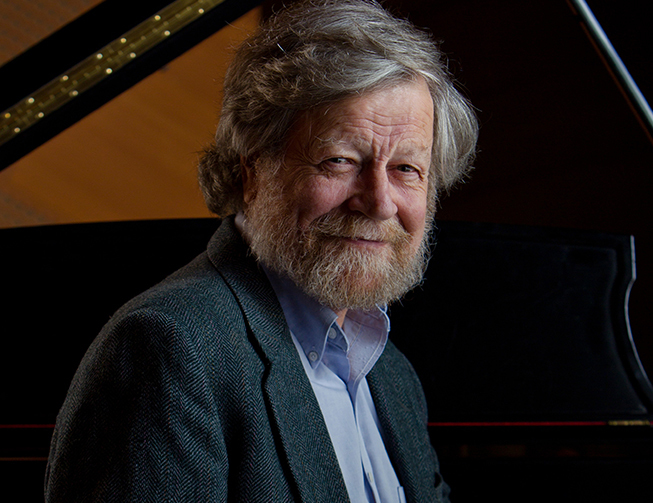 In 2014 Morten Lauridsen was named Honorary Artistic President of INTERKULTUR/World Choir Games and in 2016 he was the recipient of the ASCAP Foundation Life in Music Award at Lincoln Center, an award presented to an ASCAP writer member for his or her outstanding accomplishments as a composer, songwriter, performer, arranger or vocalist in any genre. Further information regarding Morten Lauridsen may be found at mortenlauridsen.net and peermusicclassical.com.